Chilies, Can They Help You to Control Your Weight? Iam a huge fan of spicy hot chili peppers. When it comes to adding a little heat and whole lot of flavor to food with zero fat, no processed sugars, and hardly any calories at all – chilies are a weight loss dream. But do hot chilies really help you lose weight? Do they increase your metabolism as many people claim? Let’s take a closer look at these lip tinglers and find out why they could potential help you with, even beyond weight loss. Some of the pleasure of eating and cooking with chilies actually comes from pain. 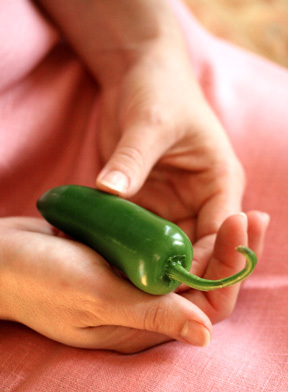 It might sound extreme, but the active ingredient, capsaicin, activates the same pain pathways than heat or abrasion. A scientist even created a scale based on pure capsaicum, called the Scoville scale, that ranks chilies according to the pain or stinging they inflict. But the burning question is, can they help you to lose weight? Yes, they can! As I mentioned, chilies bring a lot of character and flavor to cooking without unwanted calories and fat, helping you to enjoy lighter meals and lose or maintain weight. Health experts say they also help suppress appetite and from my personal experience eating spicy, hot food can also help you to feel full and satisfied with smaller portions. Chilies also cause your body to release heat and increase your heart rate – both help you burn slightly more calories during the meal. But most studies show that chilies do not increase your metabolic rate permanently although you can continue to burn calories for up to one hour after eating. Chilies are one of my favorite superfoods because they do have other very powerful benefits for the body and a unique nutritional profile. Chili peppers are a good source of vitamins A, C, and E. They are rich in folate and potassium, low in sodium, and are low in carbohydrates, and happen to be high in minerals. Because they contain capsaicin, they have recently been studied for their potential to fight fat, but already are used to stimulate circulation in arthritis medications. Chilies come in a every shape, size, color, and heat level. From the hottest, such as ghost chili (so hot, it smells like it is literally on fire) and habaneros (super hot with fruit notes), onto cayenne (very hot with a hint of sweet), jalapenos (medium hot with herby notes), chipotle (medium hot with smoky notes) and poblano (medium to mild, deep flavor of greens). Whether your a chili sadist like me or a only enjoy a hint of the heat, getting more chilies into diet is a cinch. To get the most nutrition, go fresh and use them in healthy, home-cooked meals. If you know you can’t take the “heat”, start with milder chili like jalapeño and slowly work your way up. Removing the seeds and the white membrane, where the capsaicin hides out, makes it mild. 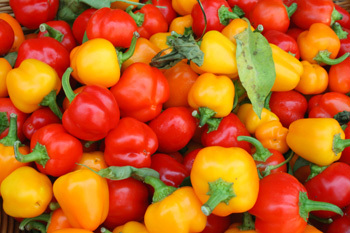 Find out how to handle hot peppers from my friend Kathy Maister at startcooking.com. Read about the best way to “cure the burn” of chili peppers and their chemistry secrets. Pickled cherry peppers are sweet and hot. Try this spicy appetizer. If you’re a seafood fan, check out chipotle orange shrimp with spicy lime mayo. Meat lovers can add chillies to pulled pork. I love chilies in most things.I try and eat them in my diet.I had to lose weightas it was making me depressed.I love your site it is informative colourful really good. A calorie ratio of 40 percent carbohydrates, 30 percent proteins, and 30 percent fat minimizes your glycemic load (insulin) and thus the fat you retain. This balance also provides the three key macro nutrients needed to keep a body in hormonal balance.